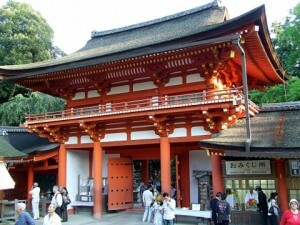 Kasuga Taisha (春日 大 社) – a major Shinto shrine Nara, built in 768, and was dedicated to the guardian deity of the city of Nara. 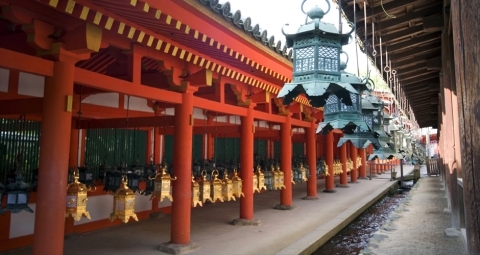 According to ancient tradition, Shinto purification Kasuga Taisha Shrine, as well as many other temples, rebuilt every 20 years, but in 1863 the sanctuary of the building remains intact. Entrance to the courtyard of the main building is free but there is also an internal chargeable area, which can be carefully examine the other buildings of the temple. At the very bottom of the garden is the main sanctuary and the related construction. 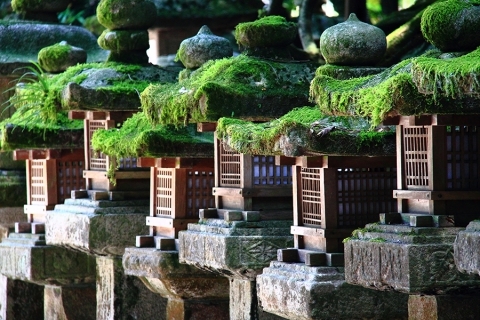 This complex – a fine example of the architectural style Kasuga, a major element of which – pitched roof, slightly overhanging the walls of the building. As for the church as a whole, in its territory you will see a large number of bright red columns and a 3000 bronze lanterns. According to ancient custom lights gave the temple of the common people as an offering and gratitude for the fulfillment of their prayers. Twice a year, during festivals Mantorov Setsubun (February 2-4) and Mantorov Obon (August 14-15), all the lights are lit the temple, and they continue to burn for a few days. 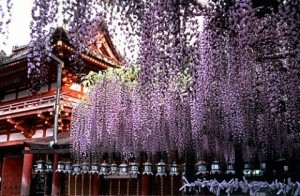 Kasuga Taisha Shrine is also famous for its botanical gardens wisteria, some of which are more than a hundred years. Wisteria flowers – a kind of mascot of the temple, as the name “Fujiwara” can be translated into Russian as “Wisteria field”. Many priestesses Kasuga Taisha wear flowers in your hair. On the territory of the temple complex, in the depths of the forest thicket, there is another sanctuary. 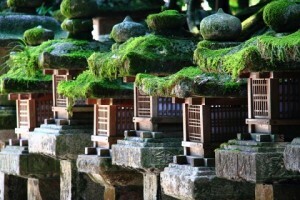 Along the road leading from the main temple, you can see 12 small shrines dedicated to the twelve gods of luck. Among the buildings of the temple stands Wakame – is held here titled dance festival, as well as Meoto Daikokusa – newlyweds temple. Kasuga Taisha Shrine is located in the eastern part of the Park Nara, a 30-minute walk from Kintetsu Nara, or a 45-minute walk from JR Nara Station Station. It is possible to get here by bus, stopping Kasuga Taisha Honden (190 yen). from 6:30 to 17:30 (from October to desks) Closed: No weekends Cost: Free (500 yen per visit internal closed area). is before 16: 30/16: 00 Closed: Mondays from December to February (or Tuesday if Monday a public holiday) Price : 500 yen. From 9:00 to 17:00 (last admission 16:30) Closed: Free of charge Price: 400 yen.